We like to visit a cheerleading group to visit our St Piran’s camp, complete with pom poms! In 2017, we enlisted the Mana squad, which is made up of 30 elite professional female dancers and gymnasts aged between 18 and 35, who sent two members of their team down to entertain our younger campers. The Mana team is the only dance group of any kind to have performed at all of the most iconic stadiums in the UK including: Twickenham, Wembley and London Olympic Stadium… and now Star Hotshots! This year, we’ll be inviting a local group to come and entertain the campers! 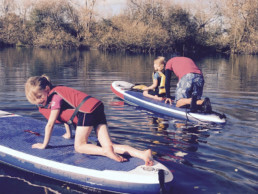 We like to get out on the water when the weather suits and new to 2018 is the option to paddle board at Moulsford. Situated on the Thames, it’s the perfect location to try this popular and fast-growing activity. The equipment and coaching expertise is provided by Go With The Flo, a local tuition company who train people of all ages on the river. Taking groups of up to six at a time, the aim is to have all children standing, turning and going with the flow! GWTF provide inflatable boards, paddles and wetsuits if requested. Sessions are weather dependant. 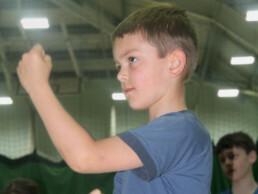 Our martial arts sessions have been extremely popular. Ross Whitby is founder of the Martial Arts School and his wealth of experience enables him to offer high quality martial arts training to all ages and levels at our camps. Ross started training in Kung Fu at the age of 12, so knows full well the influence it can have when practiced as a child. He began teaching others at the age of 16 and initially studied Kickboxing, Taekwondo and wrestling before learning both Japanese and Chinese Martial Arts to Instructor level. 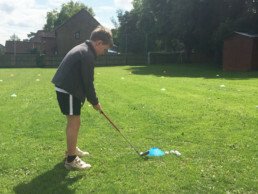 Normally used to one-to-one coaching at Goring & Streatley Golf Club itself, the team come armed with plenty of golf clubs, tees and balls as they look to get our campers chipping the ball and learning a range of skills that may one down come in handy from tee to green. Could your child be the next Rory McIlroy?! If your child wants to have fun learning street dance, then they’re in good hands! Street Feet Dance is run by Cerys Vaughan, a dance confidence coach with oodles of experience and qualifications in primary education, she is an expert in dance education for children. Cerys and her team enable Star Hotshots campers to learn dance in a safe and friendly environment without the pressures of having to take part in shows, exams or competitions. 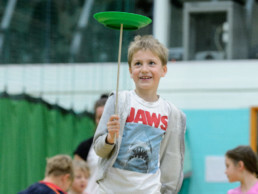 Our circus skills workshops, provided by Circus Scene, have proved great fun for all ages. Suitable for children aged 6 upwards, they enable our campers to have a go, have fun, and learn something new in an informal setting. Activities can include juggling (from scarves to beanbags and clubs), plate spinning, soft diabolos (safety tested and suitable for children), dancing styx, ribbon sticks, pedal go’s, stilts, unicycles and more! The circus workshops can be held indoors or out, but safety is a priority, with equipment used suitable for the groups involved. Stephanie Cook – 2016 GB National Rollerski Champion and GB Rollerski Series Women’s Champion – brings her rollerskiing sessions to both camps this year. Rollerskiing is the non-snow version of cross country skiing and helps to improve fitness, balance and coordination. Stephanie has been Rollerskiing/cross country skiing for almost 15 years. She used to train with the Finnish Junior National Coach alongside juniors who have since won Olympic medals. The rollerskiing sessions are aimed at children aged 9+, and children will need to bring their own helmet.